Jin CZ, Pan WS, Zhang YQ, Cai YJ, Xu QQ, Tang ZL, Wang W, Wang Y. Liu JY and Qin D G et al., 2009. The Homo sapiens Cave hominin site of Mulan Mountain, Jiangzhou District, Chongzuo, Guangxi with emphasis on its age. Chinese Science Bulletin, 54: 3848~3856. 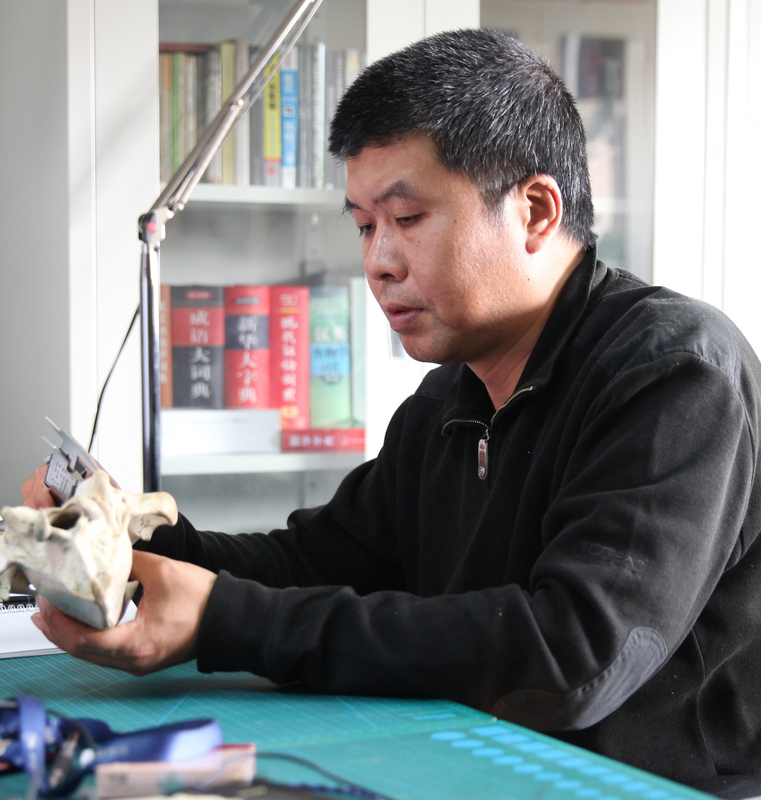 Tong HW，Liu JY and Hang LG，2002，On fossil remains of Early Pleistocene tapir from Fanchang，Anhui. Chinese Science Bulletin, 47(7): 586~590. Goldberg P, Weiner S, Bar-Yosef O, Xu QQ and Liu JY, 2001, Site Formation Processes at Zhoukoudian, China. Jounal of Human Evolution, 41, 483~530. Dong W, Xu QQ, Jin CZ and Liu JY, 1999, The Quaternary herbivore faunas in North-east China, evolution under climate change. Chinese Science Bulletin, 44 (Sup.1): 129~132. Weiner S, Xu QQ, Goldberg P, Liu JY, Bar-Yosef O, 1998, Evidence for the Use of Fire at Zhoukoudian, China. Science, 281, 251~253. Jin CZ, Zheng LT, Dong W, Liu JY, et. al., 2003, The Early Pleistocene Deposits and Mammalian Fauna from Renzidong, Fanchang, Anhui Province, China. In Yung-jo Lee eds, Palaeolithic Man’s Lives and Their Sites, 129~148. Jin CZ，Dong W，Liu JY，et al.，2000，A Preliminary Study on the Early Pleistocene Deposits and Mammalian Fauna from Fanchang，Anhui Province，China. ActaAnthropologicaSinica, Sup. Vol.19,235~245. Boaz NT, Ciochon RL, Xu QQ and Liu JY, 2000, Large Mammalian Carnivores as a Taphonomic Factor in the Bone Accumulation at Zhoukoudian. ActaAnthropologicaSinica, Sup. Vol.19,224~234. Dong W，Jin CZ，Xu QQ，Liu JY et al.，2000，A Comparative Review on the Mammalian Faunas Associated with Homo erectus in China. ActaAnthropologicaSinica, Sup. Vol.19,246~256. Weiner S, Coldberg P, Bar-Yosef O, Xu QQ and Liu JY, 2000, Evidence for the Use of Fire at Zhoukoudian. ActaAnthropologicaSinica, Sup. Vol.19,218~223. Huang WP, Zheng SH, Zong GF, Liu JY, 1993. Pliocene mammals from the Leijiahe Formation of Lingtai, Gansu, China – Preliminary report on field work in 1972 and 1992. Northern Hemisphere Geo-Bio Traverse, 1: 29~37. Nakaya H, Huang WP, Nasu T, Muto T, Saegusa H, Watabe M, Zong GF, Zheng SH and Liu JY, 1993. Excavation of the Pliocene Leijiahe Formation of Lingtai County, Gansu Province,China – Field Report of Evolutionary History of Mammalian Fauna and Paleonvironments – Late Cenozoic Eurasia and North America. Northern Hemisphere Geo-Bio Traverse, 1: 38~40.